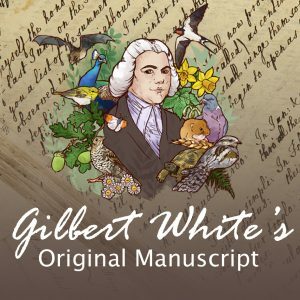 The notes recorded by Gilbert White in his ‘Garden Kalendar from 1751 to 1767 give a huge amount of information on how he grew frost tender crops such as melons and cucumbers using hot beds that used the heat generated by decomposing horse manure. His records include the number of cart loads of manure that he ‘borrowed’ from his neighbours. He was justly proud of the croiops that he grew in this way and served melons to his friends in a building known as ‘The Hermitage’ he had built at the top of the Zigzag path. The hotbeds used nowadays in the Wakes garden are constructed initially using walls of straw bales to create an enclosed space into which fresh horse manure is piled around the beginning of February. The manure is then covered with a thin layer of soil and wooden frames with glass or acrylic panels placed on top to keep in the rising heat. The temperature of the hotbeds is monitored using a soil thermometer and the temperature can be adjusted by moving the glazed panels to adjust the ventilation. We grow two cultivars of canteleupe melons, ‘Black Rock’ and ‘Petit Gris de Rennes’ and an old fashioned type of cucumber ‘Long Green Ridged’ The plants are normally brought on in the greenhouse and then planted out in the hotbeds around the end of March. 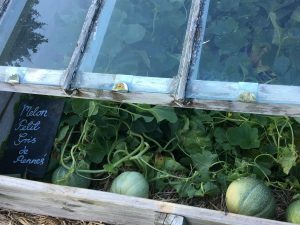 The cucumbers are usually very successful and reliable, while the melons are very prone to slugs, probably attracted by the moist, warm conditions! 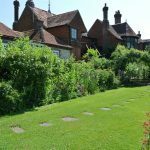 When the crops are finished by the end of the summer the spent manure is removed from the hotbeds and spread on the beds in the kitchen garden to add nutrients to the soil and make the clay soil easier to work. The straw bales are broken up and added to the compost bins.